We had an excellent turn out for Husthwaite Autumn Market and despite the unpredictable weather all of our stallholders reported a good days trading. We welcomed several newcomers, offering free range organic chicken products, delicious cured meats and smoked fish, rare breed pork and pasture fed lamb, handmade soaps, artisan pottery, plants from Husthwaite Gardening Club and a logs for delivery service joined our regular favourites. We are truly proud of the growing success of our markets and the positive feedback from our stallholders. 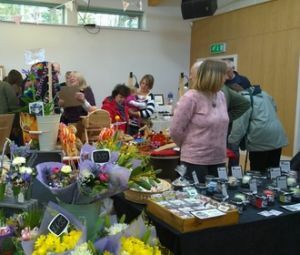 They consistently raise substantial sums for the hall and other community activities, but are also a great community asset for local people to sell and purchase local products. So a big thank you to all our stallholders, shoppers and our faithful volunteers who all help make these events a success. Anyone interested in receiving further information as a stallholder or volunteering to assist in the quarterly organisation, please contact either Annabel 0782 8173451, Lynn 0781 0263346 or Debbie 0789 4865897.